Hoping to up your retirement savings next year? You won't get much help from the government. 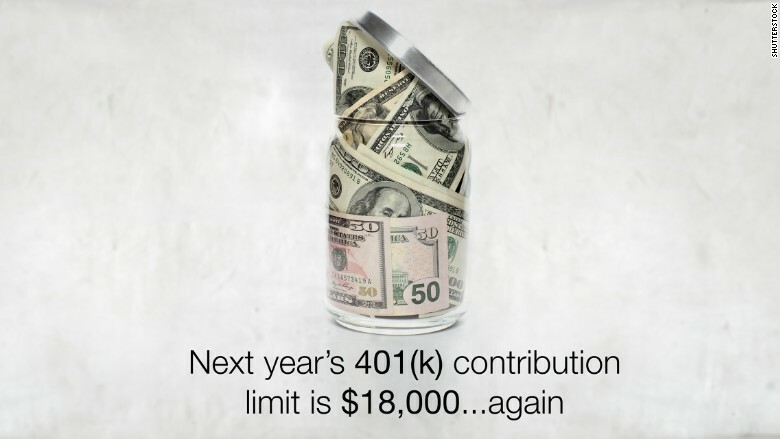 The maximum amount of money you can sock away in your 401(k) in 2016 will be the same as this year: $18,000. Each year, the limits are reviewed and sometimes increased. Last year the amount jumped by $500, but low inflation since then means it won't be going up next year, the IRS said Wednesday. The contribution caps will also remain at $18,000 for other tax-deferred retirement accounts like the 403(b), most 457 accounts and the federal government's Thrift Savings Plan. Contribution limits for IRAs will also remain unchanged, at $5,500. But there are some small changes the IRS will make in 2016 that affect who can contribute to a Roth IRA and who can deduct contributions to an IRA from their taxable income. Can you deduct your contribution from your taxes? -- If you don't have a retirement plan at work and you're under 70 ½, you can deduct the entire amount of your contribution. -- If your spouse has a workplace plan, but you don't, and jointly earn under $184,000, then you can deduct the entire amount of your contribution. -- You can deduct part of your contribution if you jointly earn up to $194,000. If you have a workplace plan, you can deduct the entire amount of your contribution if you earn below $61,000 as a single, or below $98,000 for a couple. You can deduct part of your contribution if you earn below $71,000 as a single, or $118,000 for a couple.